I’ve been one to do a lot of time lapse videos, I’ve actually been doing them since 2006, I think this was my first one, it is at least the oldest one I could find on YouTube. Over the years I have used a number of different cameras, different software and as you can see from my YouTube Channel different subjects (predominantly cars, though lots of them). So if you read my postings a month or two ago you know I had trouble with the GoPro firmware last time around. Ended up bricking the camera and having to send it in. Much better luck tonight! I got V 1.1.5 upgraded without any trouble. I wasn’t sure what the camera had on it that they sent me in exchange for my repair, so I wanted to make sure I was on the latest firmware for the trip to San Diego. I’m hoping to timelapse the drive. We’ll see if the batteries (2 of them) last the trip, I doubt it, but we’ll see. I have the camera set for shooting every 5 seconds and plan to mount it facing out the windshield. 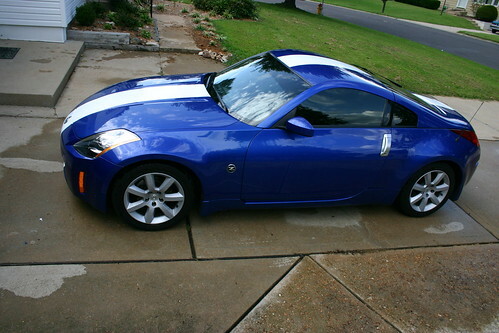 Thanks for all of you who “like” Project350z on Facebook! We’ve seen some good growth the past couple of days! So I didn’t figure I was going to have time to do the alignment on the 350z over the next couple of days, and I wasn’t sure that I really wanted to do an alignment myself after just lowering the car. I mean, I want to do it, but driving down to San Diego on Thursday isn’t the time I need to press my alignment skills. So today I took the car to the local Firestone dealer to get an alignment done today. Here’s what I told them. No problem they said, then they upsold me on the lifetime alignment. I told them, oh that won’t work for me, I’m gonna be making lots of changes, you guys won’t honor it. He assured me that they would, and even double checked with the manager. We’ll see how it works out, but I’m hoping they will honor it going forward! Really I will just want to use them here or there to verify that what I do when I make adjustments and try to align it myself. Less than an hour later I got a phone call saying that the car was ready to go. Here are the specs that I came away with. Friday I plan to do some adjustment to the Toe, getting some toe out in front and toe in in the rear. We’ll see if I can get that adjustment squared away using my longacre toe plates. If I come up with some additional settings for autocross alignment I’ll create a new blog post for the specs. So today I went back at the suspension of the car. The problem with the video is that I did the time lapse in reverse! I mistakenly sorted the photos in descending order instead of ascending. You really can’t tell on the time lapse though, it just looks like another time lapse! The night before an autocross, and I’m stoked for tomorrow, even if it rains (as forecasted). I got a replacement GoPro HD camera today in the mail. For those of you who don’t know, I had a problem with my GoPro camera, which I use a LOT! I use it for autocross videos, and time lapse videos of working on the car. A few weeks ago I was working on the car doing a standard time lapse, but the camera freaked out. I came to find out that there was a bug in the camera software that would show up with time lapse mode after 10k (I think) photos were taken. It was a known bug though, and there was a firmware update for the camera to fix the bug. So I applied the firmware update, but something during the process failed and the camera ended up “bricking” which basically means it wouldn’t work. You couldn’t power it on, you couldn’t use it, nothing, it was as useful as a brick. Since I got the camera for xmas it was still under warranty so I contacted GoPro about getting it fixed, while it took a bit of back and forth via email with their customer service reps, they provided me with an RMA number to send it in. This was a couple of weeks ago, right before a 2 day autocross and right before we were heading out of town for vacation, so I didn’t get the camera mailed out until Tuesday of this week. On Thursday I got an email from them saying that they had a replacement camera ready to mail out, but I hadn’t included a return address. I replied with our address, and then on Friday I got an email saying it would go out. It is nice that we live about 15 miles from their headquarters because the camera showed up today via USPS. I’m not positive that the firmware fix has been applied to this camera yet, but I’m going to leave it as is for now. I want to use it at the autocross tomorrow, so I don’t want to run the risk of bricking it again! So I experienced something while driving the 350z yesterday that I haven’t experienced in quite a while. Typically the 350z comes with a staggered tire setup, meaning that the front tires are usually a smaller size than the rears. A week or two ago I got some new street tires put on the car, the new tires are “square” meaning the fronts are the same size as the rear. This actually gives you the ability to rotate the wheels/tires (assuming the wheels are the same size), which can go a long way in making your tires last longer. The old set I had taken off were actually okay in the front, but the rears were bald, being able to rotate could have helped prevent that. The downfall of having a square setup, at least with a 350z, is that the computer isn’t setup for that, not having the stagger causes the front tires to run at a different speed in relation to the rear tires. This causes the computer to freak out, though most of the time it is fine, where it will freak out is typically when you are accelerating on an onramp. I had this happen for the first time since some time in 2006 (when I sold my first 350z) last night. It wasn’t a huge shocker, but it was a bit of a surprise. You can avoid the computer issue, but it requires turning off the traction control, something you can’t do when it is activated by the differing speeds. So for now, I will continue to turn off the traction control (tcs) when I get in the car. I’m curious to see if there are any ways to disable the TCS by default, and only have it turn on when you press the button. 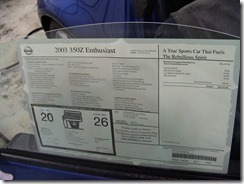 That would be extremely useful in autocross as you NEVER want traction control in a 350z enabled when autocrossing. So with all the blogging I’ve done over the years I have been unable to find any posts where I mentioned tire pressures! So here it is, a thread that I will continually update with tire pressure information for my 350z. As I change configurations I will move settings to an archive down below.